Where are YOU going this Year? 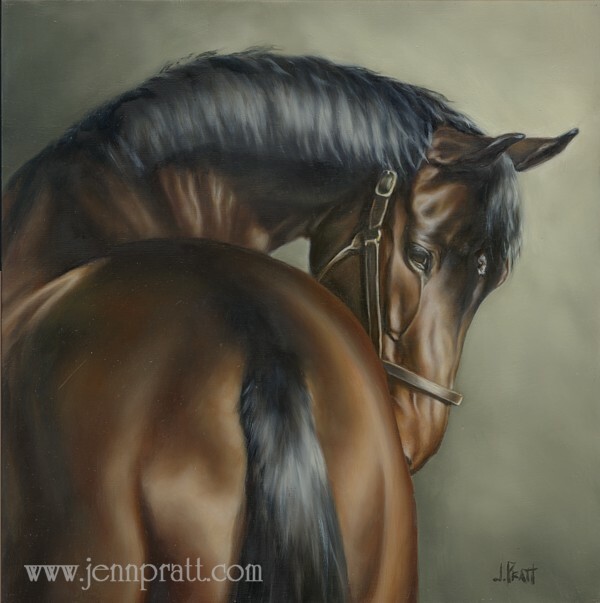 | Jennifer Pratt Equine Artist. 1. Let’s Reminisce – January 27th, 2009 on my blog, I announced to my clients, friends, colleagues and most importantly myself that I was moving on from Coloured Pencil media and delving full-time into the world as an Oil Painter. Here I am one year later, successfully building my portfolio and my reputation as just that. I have no regrets and honestly it was the best choice I ever made. At this time I must truly thank all my clients and collectors who trusted and believed that I could make the transition successfully. There were a number of you (and you know who you are 🙂 ) that hired me as a coloured pencil artist and ended up with an oil painting. Judging from your kind words and enthusiasm with the finished product, I know I didn’t let you down. 2. 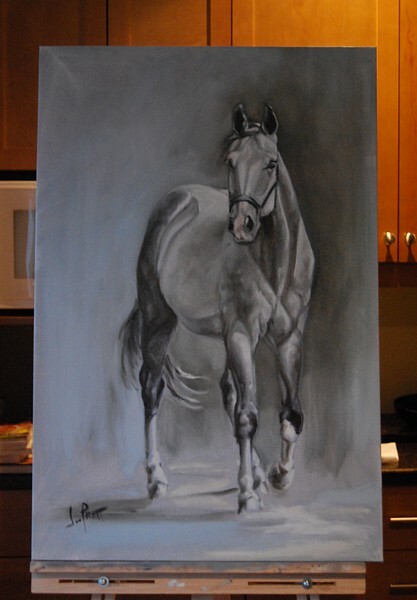 Olympic Horse Commission – Gran Gesto – In June I attended my first professional oil painting workshop at the Academy of Realist Art in Toronto. I studied the techniques of John Singer Sargent. Considering I had never done a workshop or let alone painted a human before, I was quite nervous! However I completed it, and with it came a new understanding of oils as well as who I was becoming as a painter. I started my commission of Gran Gesto over after the workshop and completed it in the fall. Handing that painting over to our Canadian Team rider Jacquie Brooks and feeling her excitement was certainly the top professional moment of my year. 3. Perseverance – Immediately after the Gran Gesto painting was delivered I was given a wonderful opportunity by client Erin McLaughlin, editor of Canadian Gardening Magazine. Her home was being photographed the following week for the February 2010 issue of Style at Home Magazine. In my studio, I tend to work on one commission at a time to completion. Now, the Gran Gesto painting had just been delivered, I had very limited time to wrap my head around finishing Erin’s painting. It was started, but NOT complete. So enough celebrating 2009, and onto 2010. What does it look like? Where am I going?? After thinking long and hard I decided this year I’m climbing mountains!! That’s right – I am a MOUNTAINEER!! While I have specific life and career goals for 2010 such as; keeping a sketch journal, traveling to workshops, colour study, eating clean and being ‘present’ with my home life; My key overall objective for 2010 is consistency. I recognize can loose direction and get frazzled when ‘life’ happens. Much of the time it’s my reaction to ‘life’ rather than resolving what actually happened ~ thus causing IN-consistency. 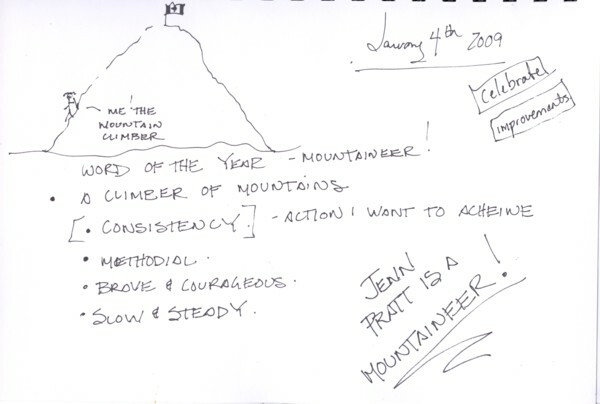 When I took a moment to think about what consistency actually looked like, I envisioned a mountain climber. Slow and steady, one foot in front the other, never losing course. They are methodical, courageous and brave. Plus I believe there is a prize when you get to the top?!! So this is me as we go into 2010. Please wish me luck and I’m interested to know where you are going in 2010!!?? I absolutely love your paintings and after reading your resolutions for 2010 and your past accomplishments, I am moved and inspired by your words. You are an inspiration to me and your analogy of the mountain climber is awesome. I was reminded of the the song that Miley Cyrus sings “The Climb”, after reading about your resolutions for 2010 which I think puts your words into song. I love it!!! Please put me on your email list for newsletters if that is what you do???? Also for sure I am one of your fans and facebook friends. Keep on trucking and all the best for 2010!!!! thank you Diane! I”m so glad to hear that i’ve inspired you. As artists we need all we can get! sometimes finding the right key word for motivation helps. I’m printing ‘Mountaineer’ big and posting it in my studio! Yes, I will put your name on my newletter. love your way capturing of horses! i’m photographer, bu very love to paint, can i ask you for a bit help? how can i email you? got your email Nadina, thanks! Your work is beautiful already so I cannot wait to see what the top of your mountain! I am still not sure of my goals but I am toying with the idea of maybe taking my baby horse out recognized and adding a splash of color to dressage (he is an Appy). I think my word of the year is going to be courageous. great word ‘courageous’ – thanks for sharing and reading! Jenn, you inspire us all. Would love to scale a peak or two with you, should the opportunity present itself. wow Jennifer, this is such an inspiring post! I love how you’ve connected your word with a visual – I’m going to try that, I think it carries more weight than a mere word. You’re right about being frazzled when life ‘happens.’ These are really good ingredients for staying focused 🙂 Your work is beautiful, well done!! We are visual people – so I it makes more sense to me. Thank you for reading and commenting – all the best to you in 2010!! hello, just clicked over…lovely work and I like your mountaineer diagram! btw, here are my goals. i do them in the fall too. but i think i am going to diagram them with power words like you did–that was a great idea.